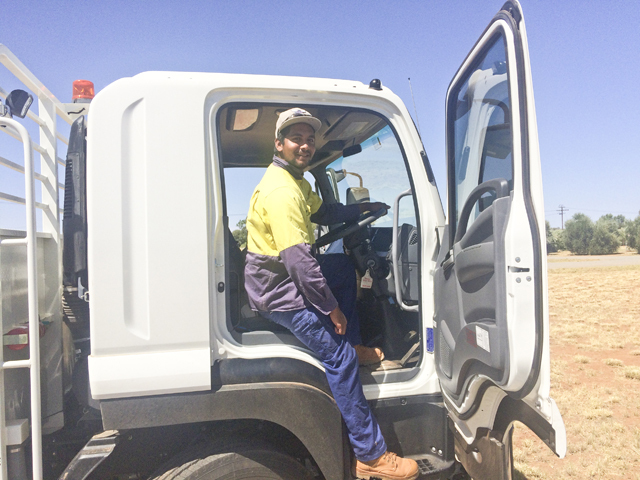 With just a year on the job, Indigenous apprentices with the Department of Primary Industry and Resources (DPIR) have already added several skills to their resumes. DPIR’s apprenticeship program provides opportunities for Indigenous people to gain skills and find employment in primary industry. Aaron Braun and Dylan Williams are one year into a three-year Certificate III in Rural Operations, which provides training in everything from horticulture to cattle management and small engine mechanics. The horticulture component involves working at the Arid Zone Research Institute (AZRI) as well as planting, irrigation, pruning, training vines, applying herbicides and pesticides and using safety equipment at DPIR’s Ali Curung operations. Cattle management ranges from mustering at Old Man Plains Research Station to hand-feeding poddy calves, as well as learning about castration, dehorning, branding, and safety around animals. The training provides a range of opportunities and can act as a stepping stone into different areas of the department. A third DPIR apprentice, Stevie Oliver, is undertaking a one-year Certificate III in Business Administration. Click to find out more about Indigenous training and employment opportunities in the Northern Territory Public Service.